Samsung Electronics Co. is seeking to stretch its technological prowess to the network equipment market by capitalizing on the 5G migration momentum and slackening in Chinese ascension due to U.S. protectionist actions. The world’s biggest chip and smartphone maker has set out to dominate 20 percent share in the global 5G network equipment market by 2020, according to industry sources Tuesday. The big three market players are currently China’s Huawei, Sweden’s Ericsson and Finland’s Nokia. 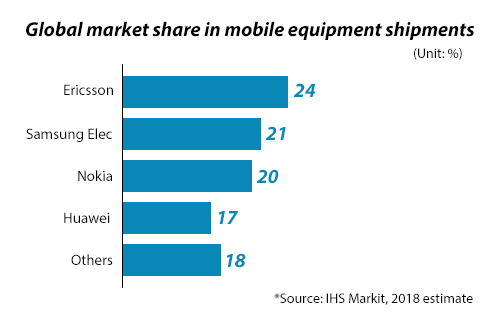 According to the market research company IHS Markit, Ericsson unseated Huawei as the world’s top mobile equipment provider in 2018 with a market share of 29 percent. Huawei’s market share fell to 26 percent as its sales took a hit from the U.S. government ban on its products. The British researcher projected Ericsson to claim the largest share of expected 5G equipment shipments at 24 percent. Samsung Electronics was forecast to rise to No. 2 with a share of 21 percent, elbowing out Nokia at 20 percent and Huawei at 17 percent. Samsung Electronics is one of the few vertically integrated companies capable of commanding the entire supply chain of 5G hardware, from mobile chips and network equipment to finished devices like smartphones. When it comes to mobile equipment, it is the only local player with a sizable presence in the world market. The 5G network equipment market is set to enjoy explosive growth, expanding at an annual pace of 59.3 percent through 2025, according to the research firm Persistence Market Research. Samsung Electronics was the world’s first company to introduce commercial 2G network equipment in 1996. Today it holds a market share of about 20 percent in the 4G long-term evolution (LTE) equipment market in many advanced countries including Korea, Japan, the U.K. and the U.S. In the fast-growing Indian market, it commands the dominant 70 percent share. The Korean company has been actively rolling out 5G network infrastructure at home and in America, two markets at the forefront of the new wireless technology. It was the world’s first company to commercially deploy 3.5-gigahertz and 28Ghz 5G operating equipment systems. As of February, it delivered 36,000 base station equipment products to clients in both countries, claiming an early lead in the 5G race. Since April 2016, Samsung Electronics has worked closely with 23 developers to create 5G standards. It was also part of the 3rd Generation Partnership Project (3GPP) that became the global mobile standard for LTE.